What you are reading here is not a blog. We call it a newsletter, but it’s also a magazine, the efforts of many writers. A blog reflects the voice of one person or a couple. Many readers of this newsletter have blogs. In them, they tell where they’ve been and what they’ve done. Most often they do it for themselves and for friends and family. RVtravel.com is the voice of many contributing writers including countless comments each issue from readers. We were already publishing when the first “blogs” debuted. Twelve of us work on the actual staff, some part-time and a few full-time. In addition, we have an IT person who keeps our website running smoothly and a bookkeeper who helps us stay solvent. This issue, number 805, began last Sunday, when our managing editor Diane McGovern posted the shell of what would become, six days later, what you are now reading. The shell has space for my essay, news, ads and our other features. Throughout the week, various writers and editors post their articles. Russ and Tiña De Maris gather up most of the news, although we all pitch in. By about midday Friday, the gaps are filled and everything is in place. Diane and I then polish things up, trimming wordiness, and fixing grammar and typos. An email goes out to more than 50,000 of you in the wee hours of Saturday morning. The first surge of readers begins on the East Coast. Between 6 a.m. and 8 a.m, about 100 readers check in each minute. A trickle of traffic begins earlier from readers in the UK and across Europe. I wake up early Saturday morning, most often in the West, and say a little prayer that all is well — that our server didn’t go down overnight or that I didn’t make a major goof (when I do, a few dozen emails will await, telling me so). BEFORE THE INTERNET CAME ALONG, I spent my working life editing and publishing periodicals in the physical world — those published on paper. Today, I try my best to abide by the rules and ethics I learned along the way, beginning in my college journalism classes. It’s always tempting to cross the line, for example to accept money to write glowing product reviews, which is epidemic on the Web. We receive such requests every day, and we always say no. It’s tempting, too, when someone offers us thousands of dollars to email their advertising message though our 50,000-strong (and growing) mailing list. I told readers when I started this newsletter 16 years ago that I would not do that and I have stuck to that promise. As you read through this issue, pay attention to the names of the writers and their credentials. They are all experts. We know from letters that our columnists’ advice has not only helped our readers enjoy their RV travels more, but do so safely. Our columns on RV electricity by Mike Sokol have saved lives. We know because readers have told us. 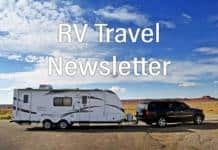 RVtravel.com is not just a hobby. It’s a serious business. We will continue to address difficult issues that other RV media are afraid to touch. This country, for example, needs more campgrounds and RV parks to accommodate the nearly half million new RVs sold each year. And we need better ones: There are too many dumpy ones as is. We need better quality control by RV makers, and we need RV lemon laws, which the RV industry association fights whenever they’re proposed (the last thing a manufacturer wants is to allow a customer to return an RV that’s so badly made that it can’t be fixed). And buyers of new RVs need to be better educated before plopping down six figures on an RV only to discover it’s not right for them or riddled with defects. The RV lifestyle is wonderful. But there are problems in Paradise, and my staff and I will try our best to influence positive change. The more readers we have, the louder our voice. 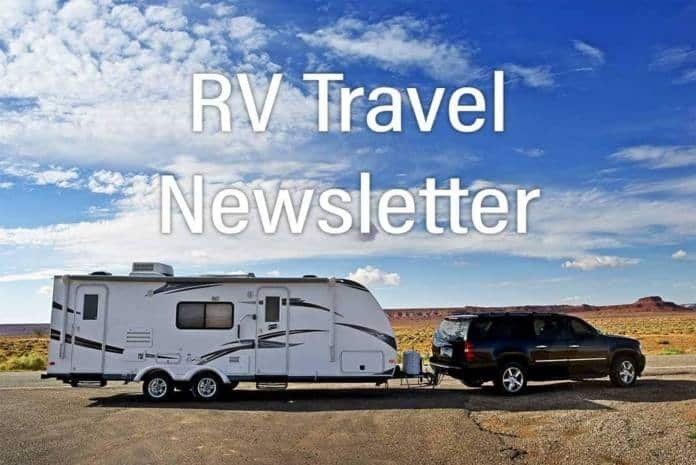 And that is why we periodically ask you to please tell your friends, club members, Facebook friends and any other RVers or wannabees you know to sign up for this weekly publication. It still costs $10 for a lifetime Senior Pass to American National Parks. But not for long. On August 28, the fee jumps to $80. Publicity over the dramatic price hike has sent eligible citizens flocking to National Parks and other NPS sites to get one. The demand has been so high that some parks have run out of passes with only weeks to go before the price hike. Read more. 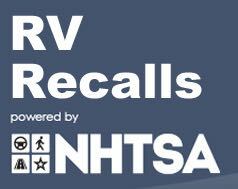 The list of latest recalls on RVs and other vehicles and/or products of interest to RVers has been released by the U.S. National Highway Transportation Safety Administration. The list includes models from Entegra, Forest River, Jayco, Keystone, Lance, Newmar, Thor and others — plus other vehicles commonly used by RVers. Is your RV or other vehicle on the list? Find out here. We have a winner! No more entries, please. The answer is: When Mama yelled for her son “Billy” both he and the goat came. Win this Stanley 40-piece socket set. The winner will be chosen randomly out of all correct entries received by noon (Pacific), Sunday. The question: What is the secret phrase listed far below? Email your answer to RVcontests (at) gmail.com. We can only ship prizes to addresses with a U.S. Zip Code. Only one entry per household. All entries must include your mailing address and telephone number (only used for mailing if you win) or your entry will be disqualified and we’ll choose the next (correct) entry. Contest ends Sunday at noon (Pacific), at which time a winner will be selected by Random.org. We’ll let you know if you win. RVs continue to fly off the assembly lines, says the Recreation Vehicle Industry Association. Wholesale shipments of RVs to dealers in June are on a high — overall, 47,416 out the door, up more than 18 percent compared to June 2016. Towables are tops — 42,240 units showing a 20 percent jump over 2016. Motorhome were much slower, at 5,176 coaches, but still showing an increase in shipments of 6 percent. Grand Teton National Park (Wyo.) officials are gearing up for what they figure will be their busiest day in history: August 21. The park anticipates hordes of humans will storm the park in search of a glimpse of the solar eclipse. Rangers have set aside five special viewing areas, and all staff will be on hand to help direct traffic. Hoping visitors will have a “realistic expectation” of what the day will be like, a park spokesman used the term “gridlock traffic,” and recommended bringing a full gas tank, food, water, medications and, of course, suitable viewing glasses — even if you can only roll down your window to view the eclipse from your car. An American couple RVing in British Columbia is getting partial credit for saving a cyclist from a grizzly bear. Donald Poster and Cassie Beyer were near Radium Hot Springs when they spotted the bruin chasing a man on a bicycle down the highway. Poster steered the coach in, honking at the bear. Two other drivers spotted the action, and one attempted to put his vehicle between the cyclist and the bear. Between horn-honking at what must have appeared to the bear to be weird human conduct, the bear stopped the chase long enough for the cyclist to make an escape. Police in Utah’s Sanpete County are warning RVers about a rash of burglaries and potential arson cases involving rigs parked and left unattended in the county’s rural areas. One RVer reported his trailer was cleaned out, including “even a couple of bags of marshmallows.” Others have seen valuables taken and huge amounts of damage left behind. At least one RV was torched by arsonists, with another under investigation as a possible arson case. You can camp for free at scenic Cuyamaca Rancho State Park in rural San Diego County if you’re willing to help clear vegetation and maintain trails on Saturday, Aug. 19, from 8:30 a.m. to 1:30 p.m. Teens 14 and older are welcome with a guardian. Pre-registration required. Learn more or register. Winnebago’s Middlebury, Indiana, plant has been fined $10,000 related to the death of a plant worker who was killed when run over by a forklift in April. The state’s Occupational Safety and Health Administration cited the RV builder for not operating the forklift at a safe speed, and for a windshield on the lift adversely affecting operation. The bear that grabbed hold of a sleeping camper’s foot in Idaho’s Sawtooth National Recreation Area has been killed. Wildlife managers report that the same bear had also “rubbed up against a woman reading a book,” and disturbed other campers in the area. While it always fled when yelled at, officials say its habituation to human contact made it too dangerous to be left free. Oregon Eclipse Camp is releasing a limited number of camping spots near Unity, Oregon, directly in the center of the totality path for the upcoming August 21 solar eclipse. Easily accessible by paved road, with spacious pull-thru and back-in RV sites, Oregon Eclipse Camp is offering families and seniors an eclipse viewing experience away from the commotion and bustle! Learn more at OregonEclipseCamp.com or by emailing info(at)oregoneclipsecamp.com . Primitive auto air conditioning system. Manually controlled. No Freon necessary. Commonly found in automobiles in the late 20th century. Michigan state parks are under attack — by bugs. Invasive insect species are playing havoc with trees in the parks, from ash trees (emerald ash borer), to oaks (oak wilt), to evergreens (hemlock woolly adelgid). Now maples are in the insect crosshairs, with the Asian long-horned beetle looking to be the next Park Enemy Number One. Park officials are contemplating new rules that would outlaw firewood not certified as heat-treated. Trouble is, there are presently only three producers of the “safe” firewood in the entire state. Since the city of Los Angeles (Calif.) is having a hard time getting decrepit RVs towed off the streets, a councilman has come up with an idea he hopes will resolve at least part of the problem: Make it easier for street-dwelling RVers to dump their holding tanks. The suggestion is that the city partner with dump station owners to take vouchers from RV dwellers who are on a waiting list for housing services. A Gig Harbor, Wash., family escaped with minor injuries after their SUV pulling a trailer crashed on Interstate 90 in Eastern Washington Thursday night. According to the Washington State Patrol, the GMC Yukon was headed westbound on I-90 when the trailer began oscillating back and forth. The driver lost control, crossed over the freeway and crashed in the median, just west of the town of George. Troopers said the SUV and trailer detached from each other before the crash. Troopers said the driver was going too fast. He was cited for negligence. Source: KOMOnews.com. Not only do grasshoppers jump in North Dakota state parks, so do the fees. As of August 1, the entry fee rose $2 to the new $7 price. Come November 1, the annual pass fee shoots up $10 to $35. Ever seen a pink travel trailer? You might have if you were in Windsor, Calif., recently. Not only a pink trailer, but there were 13 other pink vehicles, sidewalks, bushes and streets. The color change was attributed to a firefighting tanker aircraft, which somehow dumped 100 gallons of fire retardant on the not-on-fire residential neighborhood while making an approach to a nearby airport. Local firefighters came out and washed down the colorful rigs. According to authorities, the retardant is harmless to humans. Click here for more information about using Airtabs™. Click here to purchase Airtabs™. Mesa Verde National Park (Colo.) joins other public treasures reporting an increase in visitor-created vandalism. An archeological site was dug up, ancient charcoal removed from it, then used to post names on rocks. Other rocks in the park have been “painted” evidently as clues in a scavenger hunt. Park officials are quick to point out that those damaging resources are a small minority, but pleads with other visitors to immediately report vandalism. A Texas family that earns its living by appearing at renaissance fairs pumped $80,000 into a new fifth wheel [brand unknown to RV Travel] to live in and travel about the circuit. Not long after the purchase, Bryan and Brittany Beard noticed water leaks from the walls. The manufacturer agreed to allow a local shop to fix the problem, but not long after that, more issues: Some of the rig’s flooring felt “soft.” This time, the selling dealer looked it over and found black mold and rotting flooring. The dealership couldn’t promise much — particularly since the family needed the rig for work. The dealer asked for “an open checkbook” to cover repair costs. The Beards asked a local TV station for help — and the dealer refused comment. Case closed? Nope. Shortly after the station attempted contact with the dealer, the Beards got an offer from the dealer to buy back the faulty rig, and sold them a new unit for a bit more than they paid for the bum rig. The Royal Canadian Mounties always get their — bear? It would seem so, based on the story from Waterton, Alberta. Authorities were called when a young black bear came into the village, a place where bears are not welcomed by locals. A team of bear “hazers” was sent in to discourage the bear, and one of them, an RCMP officer in traditional red serge uniform, was spotted chasing the young bruin — a sight not soon to be forgotten by visitors. Escapees RV Club is rolling out a new benefit for members. Escapees Healthcare Solutions includes an option of enrolling in a variety of wellness service insurance products, and one of them is Affordable Care Act-compliant. How would you describe the quality of workmanship on your RV? With the August 21 eclipse getting closer, state and national parks in the path of the solar event’s totality are ramping up for huge crowds. Planning on watching the eclipse but unsure of where to go? Here’s a resource that you may not have thought of: U.S. National Wildlife Refuges. Learn more. Editor Chuck Woodbury has received yet another email about the current crowding in campgrounds and RV parks. He has experienced the same frustration as Brian and Sue Robertson express here. Go into nearly any RV parts store and ask for something other than a common part and you’ll be asked to come back to get it the next day. How come? Well, most mom-and-pop RV supply outfits can’t stock everything that could be needed, so a few major parts warehouses supply smaller retailers. And a lot of those retailers give away big, glossy catalogs filled with colorful photographs of RV stuff you never knew existed. But those catalogs can help you save money on the stuff you need. How so? Find out here. National Parks celebrate our history as a country. The parks tell a story of our past, adventure and accomplishment. National Parks honor the place, as well as the people, that make our history so important. Here is a list of eight parks that honor a few of our heroes – the people that made our country so proud and strong. Read more. If you’re a boondocker or thinking of boondocking, you could have a problem. Boondockers are generally adventurous, curious, bold and sometimes daring. Those characteristics can often get you in trouble when you discover a dirt road that just must be explored or a beach that is calling out your name. Boondock Bob Difley relates some of his adventures that made him realize it’s important for boondockers to have a “Plan B.” Read more. What’s causing a sweating mattress? Chris Dougherty, certified RV technician, received a question about a sweating mattress from a reader while he was serving as RVtravel.com’s technical editor. The reader complained that when someone slept on the air mattress of the fold-out couch the mattress would sweat, so they had to dry it every morning with a hairdryer. They asked Chris for a solution. Read Chris’ response. Carson Vaughan and Melissa Dohmen are two full-timers formerly from Nebraska. After renovating their 18-foot travel trailer, they hit the road with their dog for adventures to come. Here is a set of reflections penned by Melissa about the realities of full-time RVing. Read more. What do you do when a big storm is on the way? Or when you’re in a campground and in the distance the sky is black and menacing? Here’s some excellent advice including a tip about one electronic device you must have aboard to help ensure your safety. What you’ll learn here could save your life. Read more. Feeding your dog table scraps? Be careful! Recent surveys at RVtravel.com have shown that about half our readers travel with a pet, most with a dog. This advice might save those dogs a bad tummy ache or even death. Learn more. Those who love — and preserve — an older RV often find a painful reality in their treasure: soft spots in the flooring. The problem is usually traced back to a water leak that’s compromised the integrity of the floor. Replacing a bad spot in the floor is challenging, but not impossible for the do-it-yourselfer. Russ and Tiña De Maris will walk you through the process. The Final Solution for RV Roof Problems? Ask any RV owner and they’ll probably tell you that their roof is what worries them the most. Mother Nature will test your RV roof. Even the smallest crack may leak, and cause thousands of dollars in water damage. Then there are interior stains, mold and mildew, and sidewall lamination decay. Want protection 24 hours a day, 365 days a year, for the life of your RV? Here’s how to get it. • National Parks to get millions for maintenance. • How many RVs have you owned in your lifetime? • Reader complains about foggy double-pane windows. • Before driving RV, please engage brain. Here are suggestions for 25 road trips to take this summer, no matter where you are in the country. From GoBankingRates and msn.com. After four decades traversing the country in search of America’s best food, Jane and Michael Stern know a thing or two about eating well on the road. They’ve written the award-winning Roadfood books — the go-to, indispensable guides to the best bites along America’s freeways and backroads alike. Check out the Sterns’ picks for can’t-miss food in every state and learn some tricks to picking out the best place to stop for a meal and what to order. From PopSugar and msn.com. Looking to spend summer days on or in the water? Even in land-locked states there are plenty of sites for swimming, boating and other aquatic adventures. Here are some of the top lakes in each state. (Be sure to check for beach and park closings before making plans.) From Cheapism and msn.com. Give Dyers a try on your next purchase of RV parts or accessories. Large selection, great service, low prices and fast shipping. The new TireTraker™ TT-500 is the most innovative & user friendly TPMS on the market with an unprecedented “Lifetime Warranty”, the only TPMS company in the industry to do so. The TT-500 features a larger, easier to read display, continuous pressure & temperature monitoring, automatic update, & monitoring up to 22 tires on your motorhome, trailer & tow vehicle from 0-232 psi! Seven day per week sales & technical support & over 12 years of experience. List price (4 tires) $389. Our price only $289. SAVE $100! (Additional Sensors $35 each). Learn more or order. Read testimonials. Regular unleaded gasoline: $2.35 (on July 31). Change from week before: Up 4 cents; Change from year before: Up 19 cents. Diesel: $2.53 (on July 31). Change from week before: Up 2 cents; Change from year before: Up 18 cents. Edna and Robert enjoy reading their RV Travel Newsletter every Saturday morning. “It’s the way we start our day,” said Edna. The couple met five years ago on Match.com. They like to camp at the coast, where they enjoy long walks on the beach. Always know the name and location of your campground including your site number (and GPS coordinates if possible). If it’s a public campground with no street address, then know which highway it’s along and the direction of the closest city. In an emergency you may have to call for help. If you don’t know where you are, you may have a serious problem. RVer Jim Long depends on RV park-provided TV cable. Arriving in a park he expected to find the female connector at his site box, but nope. Somebody had wandered off with the connector — leaving him looking silly with no way to hook up. Jim recommends carrying spare connectors in your tool box to cover such a contingency. Good suggestion, Jim! Switch off the circuit breaker at the shore power before plugging in! When leaving, switch the circuit breaker off before unplugging. Just for fun, note the times that you pull into a campsite and the breaker is still on. That tells you that the previous occupant really didn’t know what they were doing, was living dangerously, and had not read this tip! Thanks to Ron Jones, AboutRVing.com. Dry-camping RVers tend to get paranoid about LP gas usage, so being efficient is important. The Truma AquaGo® instant water heater provides such efficiency. With it, a 20 lb. LP bottle can provide 20-minute showers for 30 days, so dry campers need not worry about using hot water when they need it. Learn more here. This futuristic motorhome was built for the model years 1973 through 1978 by a major automobile manufacturer. It was not designed to be simply a “camper,” but a vehicle for comfortable travel as well. In all, nearly 13,000 of the vehicles were produced. But which company made it — Chrysler, Ford or GMC? Click here to respond and learn the answer. Easy way to level your RV! The RVtravel.com motorhome packs along two of these and, boy, are they handy! Camco’s RV Yellow Tri-Levelers are designed to raise the RV up to 3-7/8″ on any tire for a more level position. The lightweight levelers are durable and have a resin non-slip surface with a load capacity of 3,500 pounds. Learn more or order for a great price! This may be one of the easiest ways yet to build a campfire, assuming you don’t have the ability to shoot flames out of your hand like Iron Man. And there are times – when it’s cold, windy, maybe raining, or the kids are clamoring to toast marshmallows – when it is not fun, efficient or expedient to follow the usual fire-building rituals. Keeping a few Pull Start Fires in your emergency kit could make fire building much easier – and more fun. Learn more. Keep critters out of your RV! The best rodent and insect control is keep them out of your RV to begin with! A mouse that gets in through an opening the size of a dime can chew on wiring and cause major damage! Great Stuff foam sealant forms a long-lasting, airtight and water-resistant barrier to keep out what you don’t want in! Learn more or order. SECRET PHRASE: When Mama yelled for her son “Billy” both he and the goat came. CLICK HERE to see this week’s RV Travel Reader RVs. No more car wipes to dry up — this duster replaces all interior car products. The 10-inch dusting head is big enough to get your dash dust-free quickly, but small enough to leave in your glove box. The back of the duster doubles as a scrubbing sponge. Great for interior or exterior use on cars, RVs, motorcycles or in the home! Learn more or order. Can my 1986 Yellowstone travel trailer have a positive grounded electrical system? When I wire it as a negative ground, I keep blowing 40-amp fuses. Also, would I be better off to use a standard battery charger than the converter? —Hank H.
Don’t use a wimpy extension cord! Get this! Don’t be caught short when you hook up to power. And don’t use a wimpy extension cord that could get overloaded and damage your appliances or, worse yet, cause a fire. Camco’s RV 25-foot, 10-gauge, STW 30 AMP PowerGrip Electrical Powercord with handle is perfect for RV use. If your coach is wired for 30 amps, you need this. Learn more or order at a big discount. Is your coach wired for 50 amps? Then here’s your cord. Read the most recent BoondockBob’s Blog post: This land is our land. Need a Mail Forwarding Service? Then you need America’s Mailbox! You’ll enjoy great tax advantages with your South Dakota “residency” like no state income tax and low insurance rates (second lowest in the USA says the Insurance Information Institute). Many plans are available. Click the video where RV Travel editor Chuck Woodbury talks with America’s Mailbox owner Don Hume. Or click here to learn more or enroll. Read the rest of the question (it gets worse) and Mike’s response. Learn about more than 1,730 state parks, forests & recreation areas for RVers. Book includes maps, locator charts, reservation & fee info, plus contact details & website. Plus park location, directions, GPS coordinates, contact info, type of hookups, season, RV length limit & availability of showers, dump station, Wi-Fi, etc. Learn more or order. Temperature gun is ‘essential equipment’ for many RVers! Just aim this non-contact IR temperature gun to measure the temperature of your refrigerator, tires, A/C output, or, heck, even your oven (and the list goes on). It turns on and begins reading the temperature in Celsius or Fahrenheit with one press of the trigger. A laser light aids in aiming, and can be turned on or off. Many RVers consider this essential equipment. Learn more or order at a huge discount. Roger is a strong supporter of having all RVs equipped with Tire Pressure Monitor Systems. Since 2004, cars and many pickups with ratings less than 10,000 lbs. GVWR have come with TPMS installed by the factory. But RV companies have not been providing TPMS even as optional equipment from the factory, so RV owners have had to make the purchase and install the warning systems themselves while ensuring the warning levels are appropriate for their RV. Roger carefully explains how he set his TireTraker TPMS and hopes it helps you to understand how to correctly set your TPMS. Learn more. Never use oil-based or abrasive cleaners on awning fabrics. Clean and thoroughly rinse both sides of the awning fabric. Carefully follow all awning and cleaner manufacturer directions for the type of fabric you have. When you ask most RVers if there was one book that inspired them to take up RVing, it’s John Steinbeck’s classic road tale, “Travels with Charley.” The famous author set off in the early 1960s in a home-built camper with his poodle, Charley, to “find America.” And what he found makes for a delightful read. Get this for yourself or as a gift. Learn more or order. Imitation crab makes a budget meal. Inexpensive imitation crab takes on a gourmet disguise with the addition of white wine. As an alternative, make up a cup of liquid starting with 2 tablespoons lemon juice and one tablespoon balsamic vinegar. Then fill the cup with water. The crab and crackers are already salted, so don’t over-salt this dish. Complete the plate with a hot, green vegetable and sliced tomatoes. Get the recipe. Large-scale public paintings are “the people’s art works.” Many smaller communities across America are enhancing their downtowns with huge murals that reflect the historic events of their region. Cottage Grove, just south of Eugene in western Oregon, is one such community. With a population of around 10,000, it is home to 20 murals that tell the town’s stories and “colorfully illustrate” the community’s character. Read more in Julianne G. Crane’s article. If you’ve ever cooked in a crock pot/slow cooker you know how handy they are for preparing stews, soups, dips, pulled pork, etc. Well, this compact, 1.5 quart cooker is perfect for RVs, where space is often limited. And the price is right, too — less than $14 the last we looked. Read more or order. Mark Polk has tips about keeping cool when things get hot. Watch the video. Walter Cannon of the RV Safety and Education Foundation has advice. Watch the video. It will happen one day. Your RV will blow a tire or you’ll have a mechanical problem that will force you to stop alongside a busy highway. It’s dangerous out there, and that’s why highway workers wear a reflective safety vest to be extra sure they’re seen! Amazon has a large selection of safety vests for as little as about $5. Keep one of these in your RV and one in your car or truck. Be seen, not smashed. Learn more. 1782 — Washington creates the Purple Heart. 1821 — Missouri enters the Union – the first state located entirely west of the Mississippi River. 1861 — Lincoln imposes first federal income tax. 1914 — First electric traffic signal installed (Cleveland, Ohio). 1957 — American Bandstand goes national. 1962 — Marilyn Monroe is found dead. 1995 — Jerry Garcia dies. 2000 — Bridgestone/Firestone recalls 6.5 million tires. Australia’s 31,000-mile-long coastline is connected by more than 10,000 beaches. That means you can go to a new beach every day for more than 27 years! I don’t need Google. My husband knows everything. Seen at a couple of air conditioner companies: “Your wife is HOT — Better get your A/C fixed.” Thanks to Kevin P. and Steve H.! A Texan farmer travels to Australia on vacation and meets a local farmer. They get to talking. The Aussie shows off his huge wheat field and the Texan says, “Oh! We have wheat fields twice as large.” Then the farmer shows off his cattle. “We have longhorns twice as large as those,” boasts the Texan. A few minutes later the Texan spots some kangaroos hopping through the field. “And what are those?” he asks.” “Don’t you have any grasshoppers in Texas?” asks the Aussie. There is no such thing as the perfect RV. There is always something you wish was a little different. Maybe it’s a bigger bathroom, or a softer chair, or more cupboards. Maybe you’d prefer a different color on the exterior or a wood floor instead of carpet. Maybe it’s a motorhome that needs a bigger engine. Maybe the bed is positioned so it’s hard to make. About the best you can hope for in an RV is about 90 percent of what you would consider “perfect.” If you do better than that, you’re fortunate. Editor and Publisher: Chuck Woodbury. Managing editor: Diane McGovern. Senior editor: Russ De Maris. Contributing writers: Greg Illes, Bob Difley, Richard Miller, Richard Mallery, Dave Helgeson, Janet Groene, Gary Bunzer, Mark Polk, Roger Marble, Julianne Crane, Chris Guld and Andrew Robinson. Administrative assistant: Emily Woodbury. Advertising coordinator: Gail Meyring. Is there a website that rates RV’s? I’m trying to find a trailer that is built tough enough to handle Forest Service and BLM roads. Some of the roads are very very rough. There is none that I can recommend. There are websites that claim they do, but I hear too many negatives to name them. Just a thought regarding surveys, especially when determining quality and workmanship. How about including “fair” before good? Having experienced inadequacies with our Rv and seeing first hand others at the factory, I’m inclined to think that a good rating would be too good. Is there a book on using Google Earth finding boondocking rv campsites. In the Quick Tips section you mentioned knowing your location. The way we keep track of our location is to write it on a white board inside the cabinet. We write down the Campground name, address and our camp spot number. It’s one thing to know your location when you’re wide awake it’s quite another to know it in the middle of the night during an emergency. An update for your RV Clubs directory … WIT (Winnebago Itasca Travelers) Club changed their name a year or so ago. They are still WIT, but it now stands for Winnebago International Travelers. Most fulltimer folks understand the importance of “digging in” for the summer months (find a great place and just stay put for 4-5 months). Summer is “vacation & schools out” time. Weekenders fill the local parks and everyone is traveling. After Labor Day till Memorial Day parks are almost empty. Stay North till October, go Mid-States till January and head South West, South East or Central South for winter. Was sorry to hear that the Idaho bear was destroyed. Wouldn’t there have been some zoos or animal parks that would have loved the opportunity? While most of us probably don’t really care, I’ll bet the bear wishes we would have explored other options. John, that was my thought as well. A zoo, a place like The Wilds here in Ohio, could have been solutions instead of just shooting the bear. Completely agree with you. the question I have is about surge protectors. I have a 36 ft diesel MH should I have a 30amp and a 50amp surge protector or is the 50amp useable for both. need 50amp, if unit is 50 amp, can use with 30 amp if that is what park has. Some friends bought a travel trailer a number of years ago, and it came with an on-demand hot water heater. They were delighted with the idea on not having a hot water heater. It didn’t take long for them to hate this system and in less than a year they had it swapped out for the traditional hot water heater. If your looking for dash vents for your Motorhome check out Acme Products on line. They had the 2 black dash vents for my 2008 Damon Challenger in stock. Camping World told me the pars were obsolete and could not be found. Acme made my A/C parts and I needed some info and stumbled onto the vents in there catalog. Check it out if your dog , cat, child, etc had played with the fins inside the dash vents.